While the behavioural correlates and neural mechanisms of spatial attention are relatively well understood, temporal orienting – or attending to events in time – is more elusive. Similarly, the predictive capacities of the brain have predominantly been characterized in tasks requiring content-based predictions. However, in order to produce adaptive behavior, the brain needs to predict changes in its environment at behaviourally relevant time points. 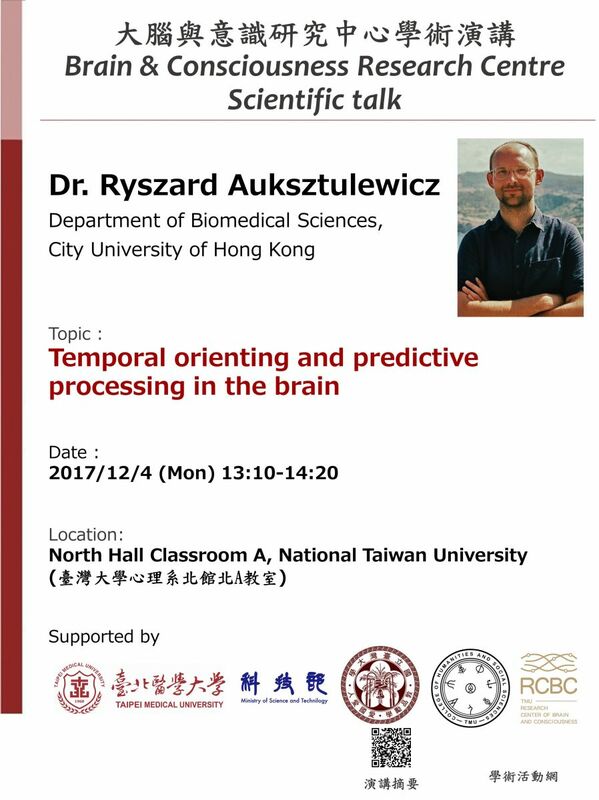 In this talk I will present results of several studies using both human electrophysiology and computational modelling to identify the neural mechanisms of temporal orienting and its interactions with predictive processing in the brain. First, I will examine the modulatory role of temporal orienting on processing unexpected sensory events. Here, a modified roving oddball paradigm is combined with magnetoencephalography (MEG) and dynamic causal modelling (DCM) to reveal the interactive effects on neural responses evoked by auditory oddballs. Using DCM based on canonical microcircuits, these interactive effects can be explained by an attentional modulation of the recursive interplay of sensory predictions and prediction errors due to increased early sensory gain at behaviourally relevant time intervals. Second, in a modelling study based on electrocorticographic (ECoG) data, I will address the question whether “what” and “when” predictions can be linked to dissociable neural mechanisms. I will show that the two types of predictability modulate neural responses in different cortical regions and at different latencies. Computational modelling will be used to disambiguate between models of stimulus predictability in terms of connectivity between brain regions and different types of gain modulation. Third, I will use MEG and EEG-based decoding in a study based on temporal (rhythmic) orienting to estimate the modulation of moment-by-moment temporal predictions on frequency tuning curves in the auditory system. These results suggest that, similar to spatial attention, temporal orienting is competitive across time points and decreases auditory gain at behaviourally irrelevant time intervals. I will also discuss the dynamic interactions of “what” and “when” predictions on auditory tuning. Finally, in a model-based MEG study, temporal predictability of visual targets and its behavioural relevance will be orthogonally modulated to reveal contextual modulation of predictability on task performance. Modelling based on a Hierarchical Gaussian Filter (HGF) will be used to explain the observed behavioural effects in terms of context-specific modulation of prediction and prediction error signaling. Interestingly, the model-based time-series of predictions and prediction errors not only show dissociable induced activity measured with MEG, but are also strongly modulated by task relevance, suggesting that current goals influence prediction signaling.